Attorney General Jeff Sessions will be held in contempt of Congress if the Department of Justice continues to refuse to produce classified information the House Intelligence Committee has demanded, committee chairman Rep. Devin Nunes said. 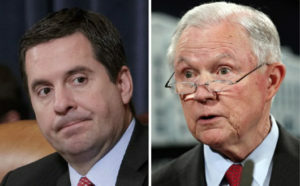 The Department of Justice, in a letter to Nunes on May 3, said the chairman had asked for information on a specific individual, not yet named and considered by DOJ to be a very valuable person for a counterintelligence operation, investigative journalist Sara Carter reported. “Disclosure of responsive information to such requests can risk severe consequences, including potential loss of human lives, damage to relationships with valued international partners, compromise of ongoing criminal investigations, and interference with intelligence activities,” stated the letter from Assistant Attorney General Stephen Boyd. Boyd stated that Nunes’ request had been reviewed by all agencies, including the White House. “After careful evaluation and following consultations with the Office of the Director of National Intelligence, the Federal Bureau of Investigation, and the White House, the Department has determined that, consistent with applicable law and longstanding Executive Branch policy, it is not in a position to provide the information responsive to your request regarding a specific individual,” Boyd states in the May 3 letter.